Mechanical timekeeping marvels often mark meaningful occasions or milestones in one’s life or remind us of someone we love. So on this occasion, iW would like to take a moment to recognize a few special anniversaries in the world of horology. The basic idea behind the Bell & Ross BR-01 was to go from cockpit to wrist while fulfilling the needs of the elite in aviation. This is the thought that initiated the momentum of Bell & Ross when it debuted this watch a decade ago. Today, the collection includes 150 models and fifty limited editions. 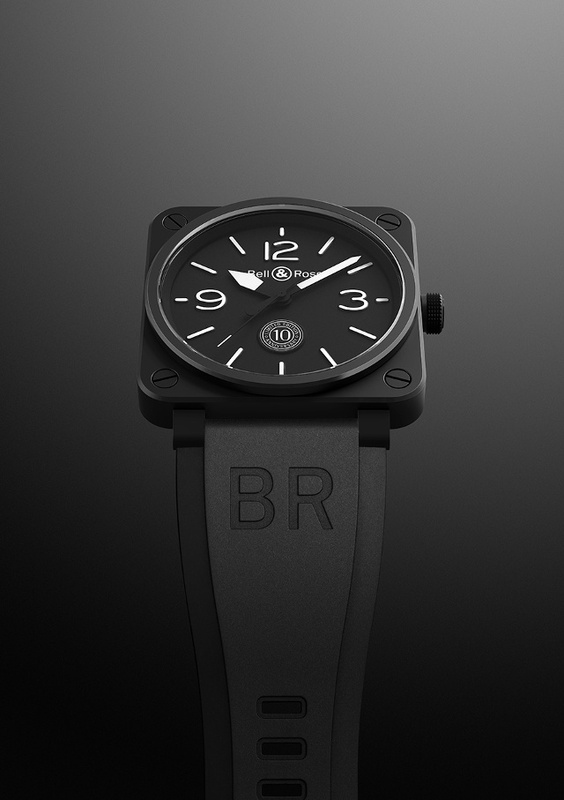 In honor of the original BR-01, Bell & Ross is releasing the BR 01 10th Anniversary’ watch using cutting-edge technologies while remaining true to the original design. The new model offers a high-tech ceramic and steel case. Each of the 500 watches in this limited series is individually numbered and marked with a special signature 10th Anniversary detail on the dial and engraved on the caseback. 200th anniversary of Abraham Louis Breguet’s appointment as the chronometer-maker to the French royal navy. In 1815 King Louis XVIII appointed Abraham Louis Breguet as chronometer-maker to the French royal navy. This essential state function tasked Breguet with building reliable and accurate marine chronometers capable of withstanding tough conditions at sea. To celebrate, Breguet introduces the Breguet Marine Chronographe 200 Ans de Marine 5823 into its Marine collection. The watch’s self-winding movement, Cal. 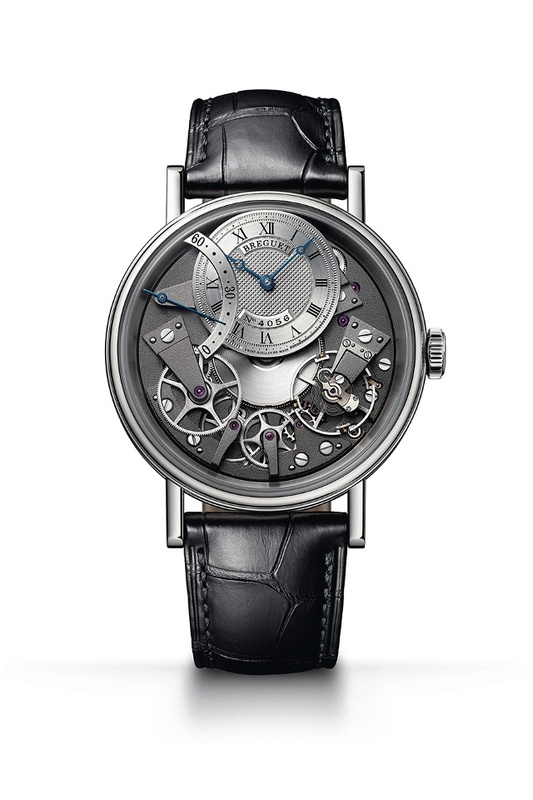 583Q/1, is limited to 200 pieces that are numbered and signed Breguet. Along with this milestone, Breguet also honors ten years of the debut of its Tradition collection with three new models: Tradition Automatique Seconde Rétrograde 7097, Tradition Chronographe Indépendant 7077 and Tradition Répétition Minutes Tourbillon 7087. In 1915, during the transition period from pocket watches to wrist watches, Breitling was one of the first to market with a chronograph wristwatch having a single pusher located at 2 o’clock. This stroke of genius was the work of Gaston Breitling, the grandson of the founder of Breitling, Léon Breitling. Over time chronograph technology evolved, making the dual-pusher design most prominent. 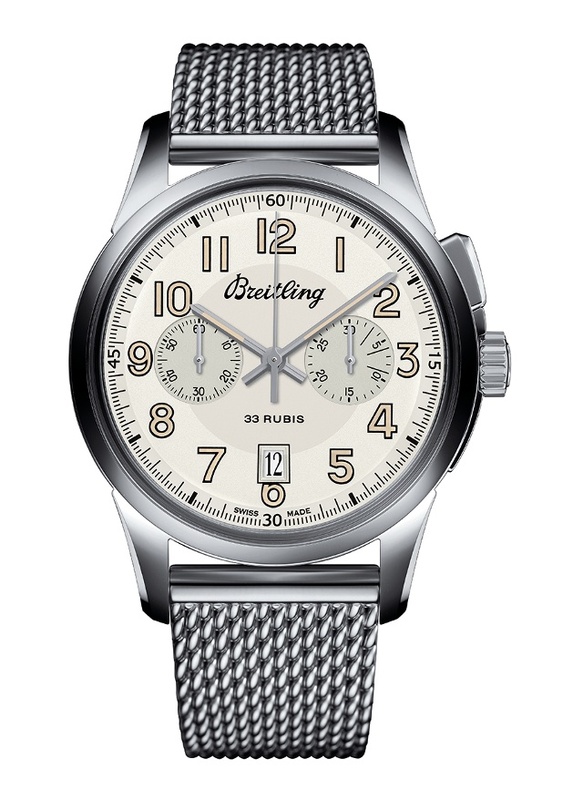 Today, Breitling honors the 100th anniversary of the single pusher with the Transocean Chronograph 1915, a limited series of 1,915 pieces and an inscription 100e anniversarie 1915-2015 along the case back. The design is keeping with in the spirit of the original watch with a revamped single pusher at two o’clock, however now it is powered by hand-wound Manufacture Breitling Caliber B14. Bulova commemorates 140 years of rich watchmaking history and American design by going back to the firm’s roots in New York City. Originally located on Maiden Lane in the heart of New York’s jewelry industry, and then located in Queens, Bulova is now moving its headquarters back to Manhattan where it now has space in the Empire State Building. All of us at Bulova are proud of the being part of a 140-year tradition of quality and innovation, said Greg Thumm, President of the Bulova Corporation. 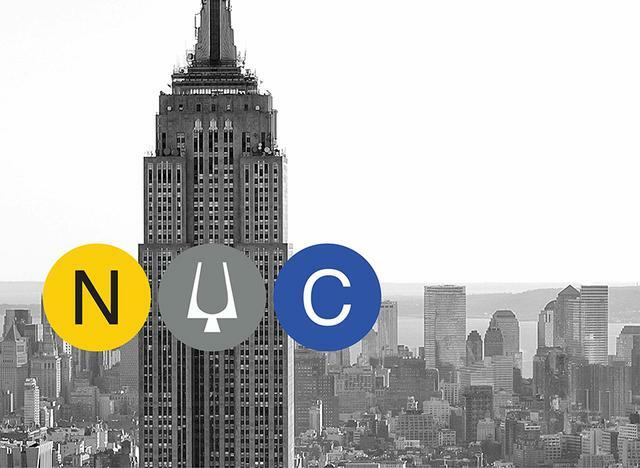 From 1875, we have been in continuous business here in New York City; and our new corporate address at the Empire State Building is a testament to relaying our American culture into the design of all our watch brands. This relocation only kicks off the celebration of the 140th anniversary. Stay tune for more announcements throughout the year. 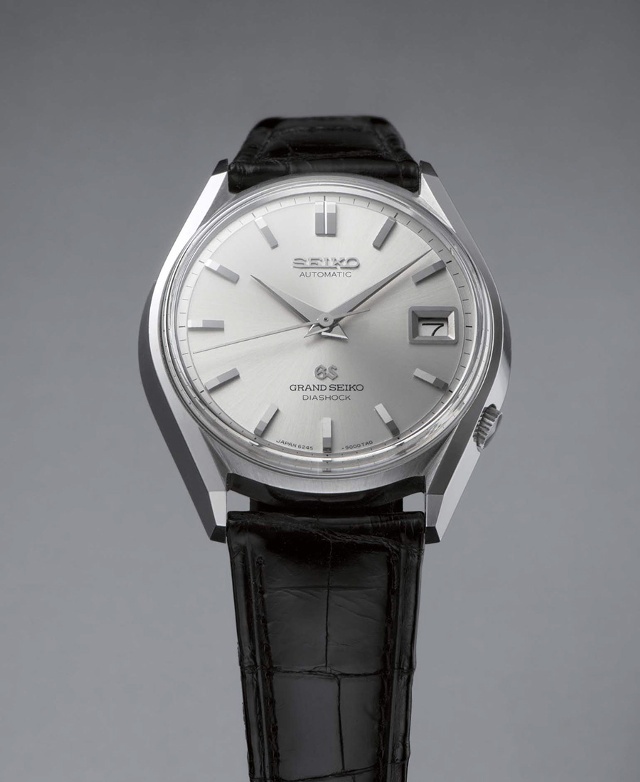 The Grand Seiko Historical Collection reflects on its 55-year history by re-releasing model 62GS from 1967, the first automatic movement for Grand Seiko. The new 62GS has eight models that embody Grand Seiko’s commitment to precision, legibility, comfort and durability while maintaining the dial markers and logo of the original model. Four of the new models are complete re-creations of the original 1967 watch, now powered by Caliber 9S65 and limited to 600 in stainless steel and 100 of each of the three gold versions. The balance of the release offers a modern reinterpretation, allowing for a slightly enlarged case size from 37.6mm to 40mm and adding new visibility of the movement through the caseback. The Hi-Beat with 36,000 vph is driven by Caliber 9S85 and cased in stainless steel with a matching bracelet. Caliber 9S65 powers the new titanium Spring Drive models. Both of these are being made in a limited availability of 1,000 units with a classic white dial and 700 with blue or black dials. The Art of Fusion, coined for the Big Bang in 2005 by then-new Hublot CEO Jean-Claude Biver, means this collection combines materials not typically used for watches. Hublot this year introduces three new models to mark ten years of Big Bang releases. Each new watch carries a proprietary UNICO movement with a column wheel chronograph with its double clutch visible on the dial side. The Big Bang Unico Full Magic Gold features a 45mm case with the patented 18-karat Magic Gold, a fusion of ceramic and 24-karat gold that Hublot melds to create the new scratch-resistant metal. Additionally, the Big Bang Tourbillon 5-day Power Reserve Indicator Full Magic Gold carries the first tourbillon created entirely in-house. 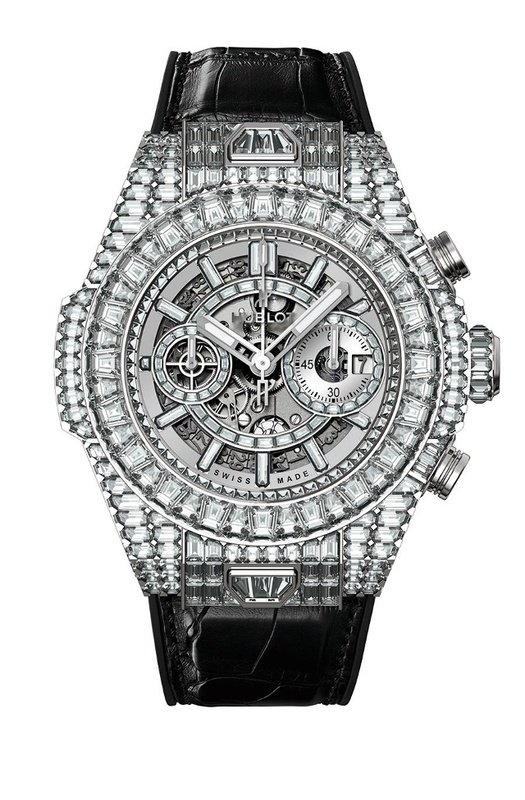 Lastly, Hublot boasts a stunning Big Bang Unico ’10 years’ Haute Joaillerie, a collection of ten high jewelry pieces with an insane amount of diamonds and precious gems said to be worth $10 million. 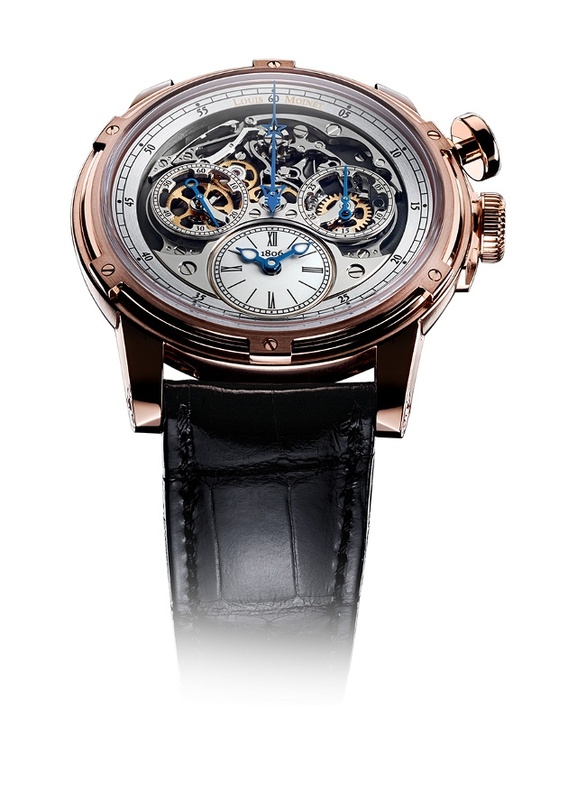 Louis Moinet is celebrating two momentous occasions with one important watch, Memoris. This 46mm watch focuses the eye on its dial-side chronograph. This should not be a surprise as the brand’s roots originate from the single-pusher chronograph invented by Louis Moinet 200 years prior. Louis Moinet together with Concepto developed this new approach for a chronograph. It offers a traditional clutch column wheel and single pusher. In order to make the chronograph the standout function, the time complication is moved to the rear of the movement while the entire chronograph function is shifted to dial side for all to admire the mechanism engage, stop and reset. 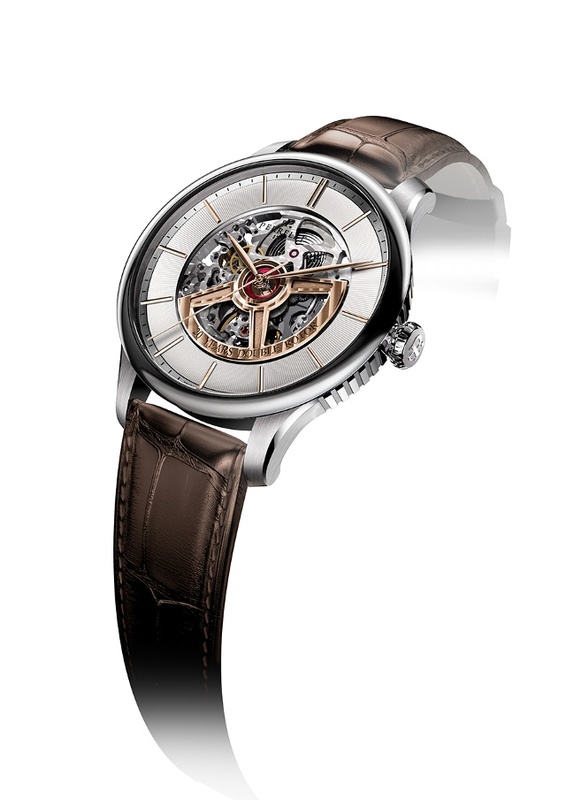 This new caliber, LM54, featured in the Memoris watch, is limited to sixty pieces. 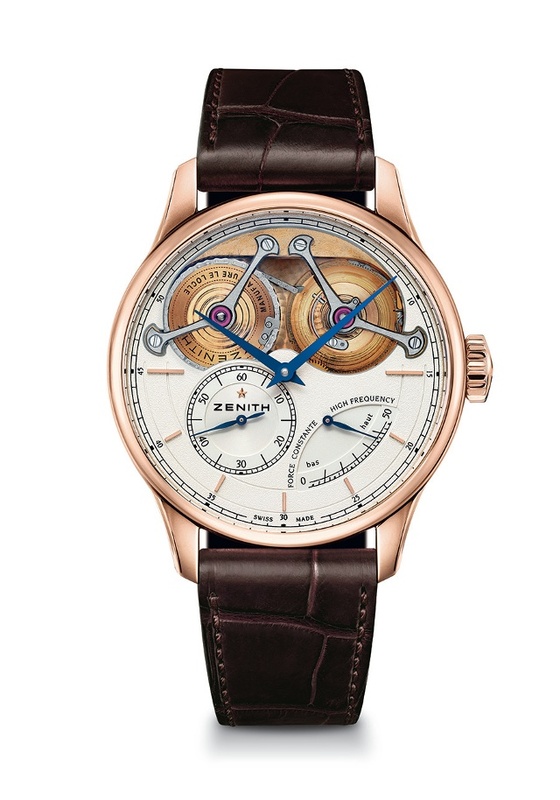 In 1995, Perrelet presented its the first Double Rotor called Dipteros model. Its double rotor was meant to honor brand namesake Abraham-Louis Perrelet and his pioneering work developing the automatic movement. Both the oscillating rotor located beneath the movement and the upper rotor on the dial side powered the barrel in this patented mechanism. To celebrate two decades of that debut, Perrelet this year introduces the First Class Double Rotor Skeleton, which now features an in-house (Soprod) Manufacture movement, Caliber P-481, made with an 18-karat 4N rose gold rotor engraved with ’20 Years Double Rotor’ on the dial side. This emblematic 42.5mm watch is limited to 250 pieces in the steel version and 77 pieces for the rose gold model. 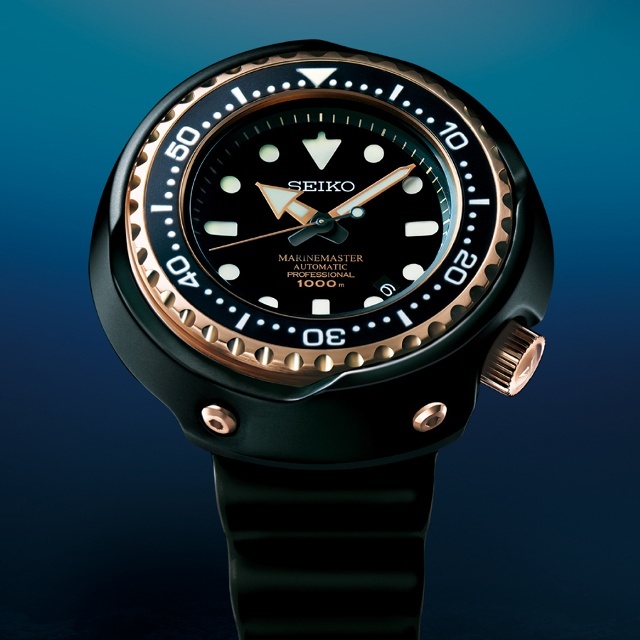 Seiko releases two new watches in its Marinemaster dive watch series. First up is the new Marinemaster Professional 1000m Diver’s featuring a two-layer case, similar to its 1975 predecessor, with an inner case structure having a L-shaped gasket. The watch also boasts a screw-down glass-fixing ring that makes it impermeable to helium and safe for saturation diving. Now with a ceramic outer shell to increase the shock resistance, and housing mechanical caliber, 8L35, this watch is ready for deep waters. Also new is the Marinemaster Professional 100m Hi-Beat 36000 Limited Edition, offered in 700 pieces, each with its own serial number. The single-piece titanium case houses the in-house 8L55 movement and beats at 36,000 vibrations per hour. Both models are assembled in the Shizuku-ishi Watch Studio in Japan. Starting with a new book by collector Joël Duval about Zenith’s history, this manufacturer also plans numerous models to celebrate its century and a half in Le Locle, Switzerland. One celebratory piece (among many) is the Academy Georges Favre-Jacot, limited to 150 pieces. The 45mm gold case features the high frequency; hand-wound El Primero 4810 movement, but adds an exceptional fusée and chain transmission that highlights the talents of the manufacture.